These buss boards provide a total of four (4) DB25 connectors, with all 25 pins of each connector wired together 1:1 as a buss. These boards provide an easy way to join , split out, create wye (Y) connections, or chain together multiple DB25 connections. Please note that not all equipment is designed or suitable to have its connections split out to multiple places. This board simply wires all connectors together and must be used with equipment for which that is appropriate. 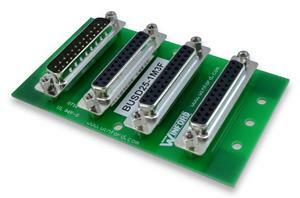 These boards are available with mounting holes and rubber feet, or with DIN rail mounting clips.